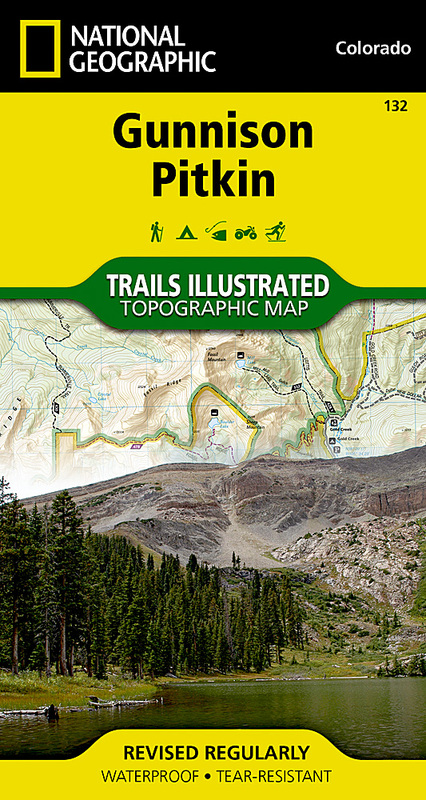 National Geographic's Trail Illustrated map of Gunnison and Pitkun offers unparalleled detail for outdoor enthusiasts exploring this scenic area on the western slope of the Colorado Rockies. Expertly researched and created in partnership with the U.S. Forest Service and others, the map covers parts of Gunnison National Forest, Fossil Ridge Wilderness and Recreation Management Areas, Roaring Judy State Wildlife Area and the city of Gunnison. The map features many points of interest, including Taylor and Gunnison Rivers; Flat Top; Square Top and Fossil Mountains; and Fossil Ridge. Get off the beaten path and back on again by following the map's clearly marked trails, Forest Service roads and BLM routes. Trails are labeled according to their designated use, whether hiking, biking, mountain biking, ATVing or snowmobiling, including the Colorado and Fossil Ridge Trails which are highlighted. To aid in your navigation, the map also displays contour lines with elevations, labeled summits, peaks and passes, water features, selected waypoints and clear boundaries between public and private land. Some of the many recreation features noted include trailheads, campgrounds, fishing holes, cross-country ski areas and wildlife viewing areas. Also provided are the Leave No Trace guidelines, wilderness regulations and survival tips. Other features found on this map include: Fossil Ridge Wilderness, Gunnison National Forest, Taylor River, Tomichi Creek.